According to "The New York Times," Undaria pinnatifada or wakame seaweed can be one of the world’s most invasive and aggressive species -- capable of growing an inch per day, edging out any local marine life and choking up beaches. However, it’s not just a pest. Wakame is actually a delicious and healthy food ingredient in Japanese cuisine. Chefs would be first to tell you of wakame’s culinary benefits. "The Sydney Morning Herald" describes it as an edible sea vegetable with a delicate, briny flavor. The Japanese have traditionally cultivated wakame by growing it on ropes tied to offshore rafts. It’s the seaweed’s “leaves” or blades that are harvested. These can be eaten raw or cooked and can be added to soups and salads, for example, to give them that extra “umami” or savory taste. Yet it’s only about 4 calories per 10 grams of raw seaweed. A classic Japanese dish with wakame is miso soup. The seaweed is simmered in dashi stock before miso and chopped scallions are added. That tiny calorie content in wakame is due to its low levels of fat and carbohydrates. It’s also rich in vitamins and minerals. 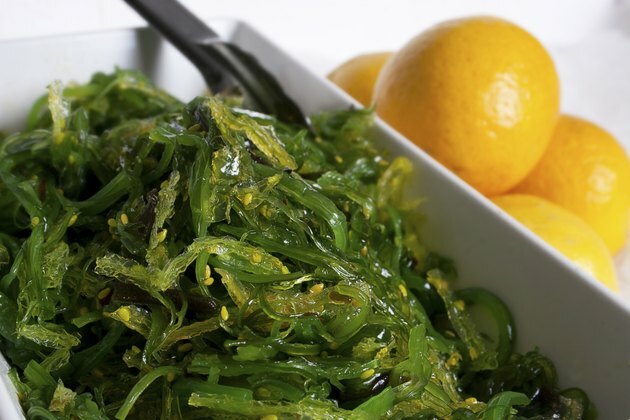 The USDA National Nutrient Database gives a complete nutritional profile of wakame; the list of nutritional benefits includes manganese, sodium, magnesium and calcium, and 5 percent of the recommended intake of folate in a 2 tablespoon serving. Wakame offers traces of vitamin A, vitamin C, vitamin E, vitamin K and the rest of the B vitamin family. Don’t go overboard with the wakame, though, as it also contains a high amount of sodium. Minerals and vitamins aren’t the only thing scientists have found in this brown seaweed. Physorg.com reports chemists in Japan have discovered that wakame contains a compound, fucoxanthin, that seems to reduce the accumulation of fat in animal tests. Fucoxanthin gives wakame its brownish appearance and aids in photosynthesis. This compound appears to stimulate fat oxidation and to stimulate the liver to produce more DHA, a type of omega-3 fatty acid that helps reduce the bad cholesterol associated with heart disease and obesity. Wakame also seems to prevent cancer. A 2003 article in "Breast Cancer Research" reported that the sea vegetable is also rich in iodine, which in a previous Japanese study on breast cancer seemed to suppress, even kill, mammary tumors. It’s speculated that the iodine in wakame and other seaweeds that are so prevalent in Japanese cuisine are responsible for the relatively low breast cancer rate in both human males and females in Japan. This hypothesis is based on the observed increase in breast cancer rates among Japanese women who turned to a Western-style diet with less seaweed intake.